What does a Hearing Loop System cost? Hearing Loop System costs vary in expense, depending on the size and construction of the room. Considering the benefit received the cost is very reasonable and the hearing loop system has minimal or no maintenance. Costs may range from $200-$300 for a home installed TV room loop or wireless (neck) loop device to $2500 – $5000 for a typical smaller facility (i.e., church) where the wire can be installed underneath the floor in the dropped ceiling of the basement. Some installations require extensive carpet work or wire installations in the grout of the tile floor. This of course increases the expense. 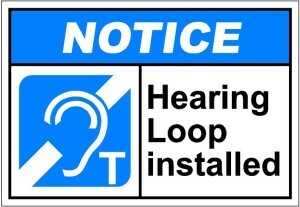 Hearing loop are most easily installed during construction, remodeling or recarpeting. Larger facilities with embedded metal will be more expensive. Auditorium hearing loops cost somewhat more than do other assistive listening systems. But the cost per user is typically less because many more people will use assistive listening that is hearing aid compatible. For the user, the t-coil cost is nominal and typically does not add to the hearing aid price. More and more public auditorium are adding hearing loop systems to get in compliance with ADA guidelines. There are many things to consider when creating a system design and installation plan. We have listed a few considerations. Proper installation also requires test equipment to ensure that the installation meets the requirements for audio loops to ensure sound clarity, sound volume and uniformity from one venue to the next. Fixed loop or portable loop? Room coverage – the whole room or just a part of it. Location of existing sound system. If any. Floor construction – wood, concrete, on grade or suspended, how much reinforcement metal is used in the floor, carpet, tile, ceramic. Ambient electrical system noise and mitigation. This is just a sample of some of the items we consider in giving you a custom quote. We encourage you to call us to discuss your particular situation. We offer free consultation and written quotes for your business or home. Give us a phone call or send an email, we would love to discuss your plans. This entry was posted in hearing aids with t-coils, hearing loop, hearing loop costs by admin. Bookmark the permalink.